EELS is a powerful technique that provides both compositional and chemical information from sub-nanometer areas in the sample. Due to the large interaction cross-sections and narrow angular distribution of the scattered electrons, EELS is very sensitive and highly localized technique. The benefit of core-level EELS is its sensitivity to all elements in the periodic table (with the exception of atomic hydrogen). The deexcitation processes are competitive, resulting in near zero x-ray yield for low Z elements and near zero Auger yield for high Z elements. These processes reach parity (50/50 yield) around germanium (atomic number 32). In addition, EELS has the ability to probe the local density of states, which makes it uniquely suited to measure changes in local bonding at near atomic resolution. High energy electrons interacting with the sample produce a myriad of signals. 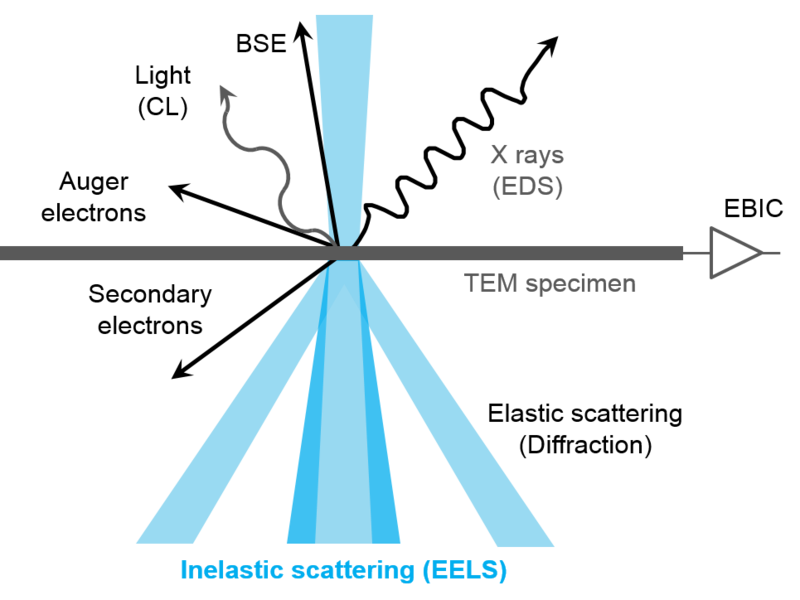 The elastic (including BSE) and inelastic interactions are the primary signals, while the other signals are secondary events caused by the sample relaxation after inelastic scattering event. The EELS signal is strongly peaked in the forward direction making near 100% collection efficiency possible. Note: e- indicates electrons (~5 – 200 keV), \(\gamma\) indicates high energy photons (UV – x-ray), and \(hv\) indicates optical photons (IR – Vis).